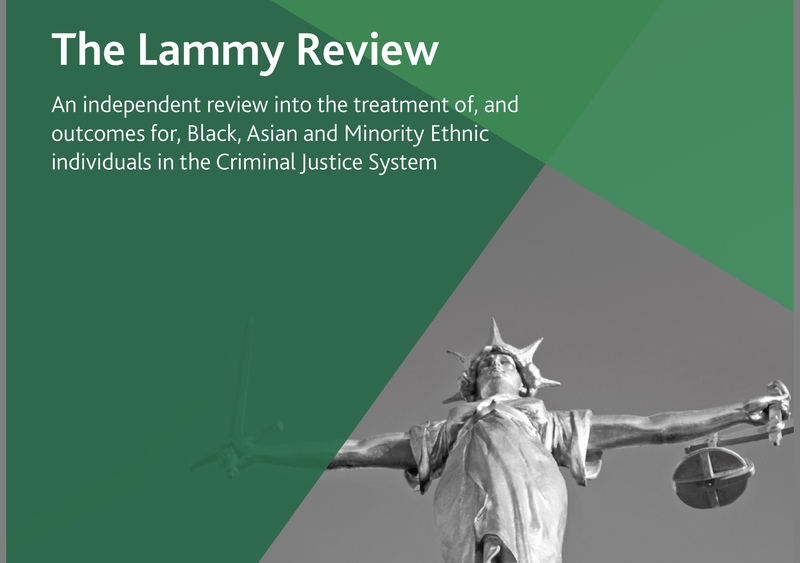 Just 5 months ago, we welcomed the “Lammy Review” into inequality of outcome for black and ethnic minority defendants, but questioned whether it could change the landscape. .
We know that nothing has changed, but that the whole criminal justice is close to collapse. Justice on the cheap means no real justice for any community – but it will always, and indeed has, affect most those that are discriminated against , those with limited means , those with no voice at all. That is who we must in a Charter for Justice. 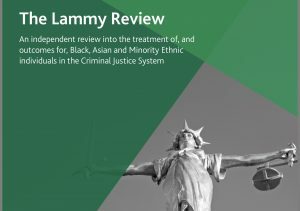 David Lammy was comissioned to prepare a report (an ‘independent review into the treatment of, and outcomes for, Black, Asian and Minority Ethnic individuals in the Criminal Justice System “ in response to the over -representation of BAME individuals in the criminal justice system. 45% of those in youth custody are from an ethnic minority – a higher percentage than the US. I borrow from the LCCSA response to Lammy – If you are a defendant in the Crown Court (and certainly should you reach the Court of Appeal) you can expect white Judges, mostly men and often still an all-white court room. Imagine roles are reversed. Imagine if you are white appearing in an all-black courtroom where you believe you have been harshly treated. Later you might read of higher sentences for white people, or that white deaths in custody never result in any prosecution. That white youth are disproportionately stopped and searched. You may imagine a lack of equality in the criminal Justice processes. Think of that role reversal when you ponder why Lammy said that there was a trust deficit ; and then ask ourselves how that is not top of the agenda for Justice Secretary, every minute of every day of every week of every year that he or she is in office. Think of that when you consider that the real trend is abolish any pretence of establishing a system with balance and checks, professionals exercising judgement from experience and training. With legal aid fixed cases cut to the bone, and a pressure to plead guilty, there is insufficient time to develop relationships with clients ; to consider, review, analyse the papers, and to properly advise clients. 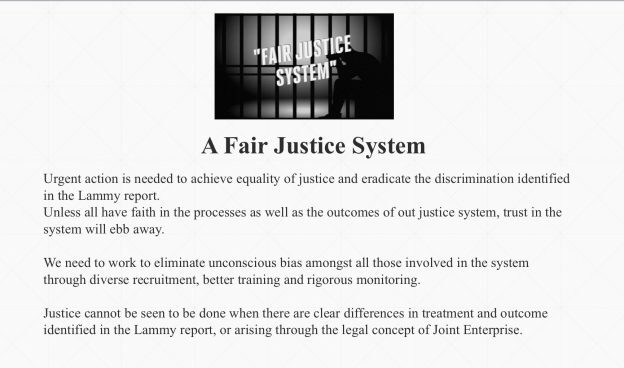 The MoJ response to Lammy pointing out the lack of trust for BAME is not to re consider how fixed fees operate ; not to look at the absurd rates of pay in police stations, to demand at how the professions train and recognise the needs of the communities that they serve…. but to welcome the development of an app that can be used to explain people rights in custody. The MoJ rejects the idea of accountabilty for the judiciary by feedback from users – lawyers, defendant or victims as if it will mean those that are aggrieved by decisions will use it as a complaint mechanism. The MoJ offers nothing new about how to increase diversity of judiciary, – of the senior judiciary 81% went to Oxbridge, 76% went to fee paying schools and half went to boarding schools. We need concrete action ; not the luke-warm response to the genuinely innovative idea of deferred prosecution for youth offending that will allow youngster not to have a criminal convictions on an agreement of behaviour in future. Good enough for a multi national company caught defrauding millions of pounds – not good enough for the balck defendant in Brent that was caught shoplifting for £50. Of course I know that the solution to this is wider the CJS It requires us to help individuals through support and intervention, to hold individuals to account through community mechanisms and to develop that individual so that he has sense that he or she belongs and has a stake. We must start with CJS. This is not just about pay for us – it is about our participation in a public service, with our own roles to play and that the same system of justice should exist no matter what the social status, race or means of the victim, no matter what the social status, race of the defendant. If we don’t have that now, we should be prepared to fight to achieve it. 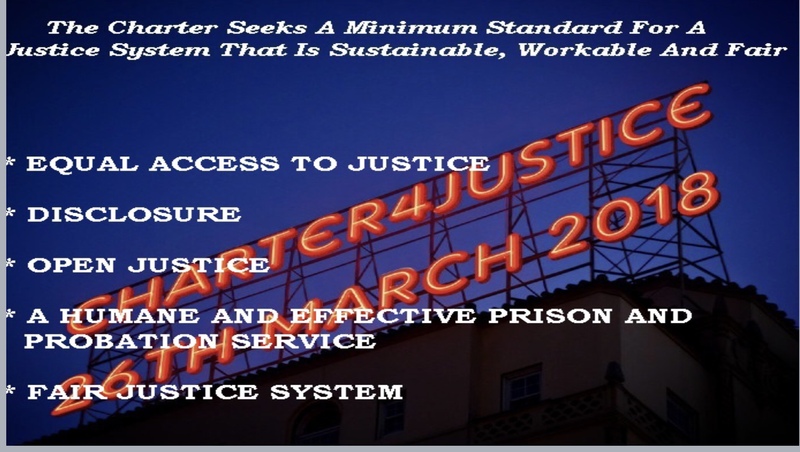 That is why striving to achieve a fair Justice system must be part of the #Charter4Justice that we must all fight for. This entry was posted in Civil Rights, Featured, Guest Blogs, Law, Legal Aid, Politics, Speeches and tagged Lammy. 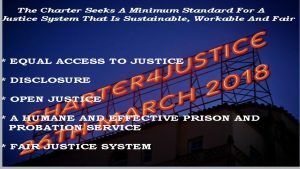 Charter for Justice on March 28, 2018 by Greg Foxsmith.